Age limit:-A child should have completed the following age as on 01 April of the academic year which admission is sought to the classes mentioned below. (a) Birth certificate issued by Military / Civil Hospitals as well as by Muncipalities/ Village Panchayats. (b) In case of Defence Personnel, POR extract duly signed by Unit Adjutant is also required. Tuition fee will be charged for twelve months of the year including summer vacation as per the prevailing rates for different categories. Tuition fee should be paid at ICICI Bank , Jalahalli after receiving the challan from the class teacher on the date mentioned. It is compulsory to pay three months fee together at the beginning of the session including Annual Fee (to be collected every year) for all the classes. Fee will be collected quarterly . No refund of annual fee or tuition fee will be made.A fine of Rs 25/- will collected along with the fees for late fees. .Student should always be neatly dressed in their school uniforms with their shoes polished and hair done. No fancy jewellery is to be worn. Growing of nails and using of nail polish / tattoo is forbidden. .Students are advised to make use of the dust-bin provided for throwing bits of paper etc., they are expected to keep the campus neat and clean. .No student should or whistle in the school building or use foul language inside or outside the school. .Students must take care of the school property. Damaging school furniture and property, Writing on the walls and disfiguring visuals is strictly forbidden. Any damage done to the school property will be severely dealt with and penalty imposed. It is individually or collectively recoverable form the defaulter / defaulters. .students are advised not to bring costly articles / mobile / camera / pen drive / watch etc., to school. The school will not be responsible for such articles or cash lost. .Students are advised to deposit unclaimed articles found in the school with their class-teacher. .Students who come to school under the care of their escorts, should not go home one their own, but should wait for them after the school is over parents are responsible o ensure that their wards are dropped to and picked up from the school on time. .Students are allowed to used the office telephone only in cases of emergency with the permission of the office-in charge. .The Pupils are generally expected to be responsible for the safe custody of their books and belongings. .Students are not permitted to practice any borrowing or lending. .Once in school, students would not be allowed to leave the school except for sickness. Parents should show their I-Card. .As per our school annual plan, all students should participate atleast in a tour or Educational trip organised by the school every year. .Students who are using their own transport / private van excluding our school bus, should take care of their safety and belongings till the first bell / after the school closing bell in their own as per their parent's insturction and parents / Private vehicle in charge are responsible for the same. One female attendant in the private vehicle is a must. Parents should have complete details of the driver. the copy of the driver's license, insurance of the vehicle etc..The parents are also requested to ensure that they pick their wards in line immediately after the school bell. 1. Application for TC / withdrawal must be given five days in advance. 2. On no account can a TC be given to a student whose fee has not been fully paid. 1. We have certain values in school: Hard work, discipline, regularity, punctuality, obedience to parents, teachers and elders, good ethics and morals, and not wasting our energy and time in meaningless frivolities. 2. 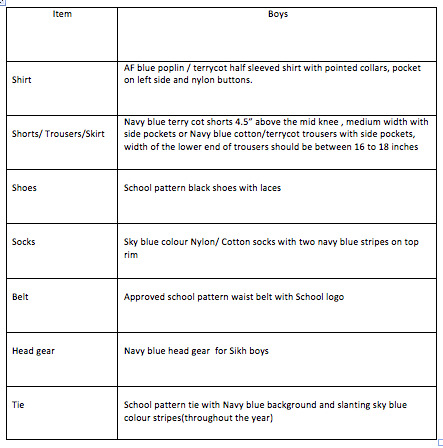 The students should wear their uniforms and ID cards at all times while they are in the school. 3. Always come to school in neat uniform. 4. Girls with long hair should plait their hair and ones with short hair should tie it neatly with hair ribbons or bands. Boy’s hair should be trimmed. 5. The students should behave decently in the classrooms or corridors and make way for teachers / elders while walking in the corridor. 6. While walking in the corridors or anywhere in the school ,behave decently , talk low and follow the ‘Queue ‘ system where ever necessary. 7. Shouting in the corridors, fighting playfully or seriously inside / outside classrooms, disregarding others conveniences depicts indiscipline. 8. Fancy hairstyles, wearing gold earrings/studs by the students are not allowed. 9. Mobile phones are banned. Students of class I – V should not wear watch.They will be confiscated if found. 10. Choose your friend very carefully, they may ruin or enrich your life. 11. Time management is quite important ; You have to plan your daily schedule carefully. .1. Parents should ensure that their wards reach school atleast 10 min.before the bell (8.30 am). School main gate will be closed at 8.25 am. 4.At least 75% attendance is required to write any school exams. A Student of any class with shortage of attendance / Fee Defaulters /with / without valid reasons, will not be permitted to write exams. 6.The students are expected to set a standard of good conduct and good behaviour in the school, in the bus and public places. The school is judged by the conduct of the students. Our students should possess exemplary manners. They are expected to greet their teachers andelders whenever they meet them. 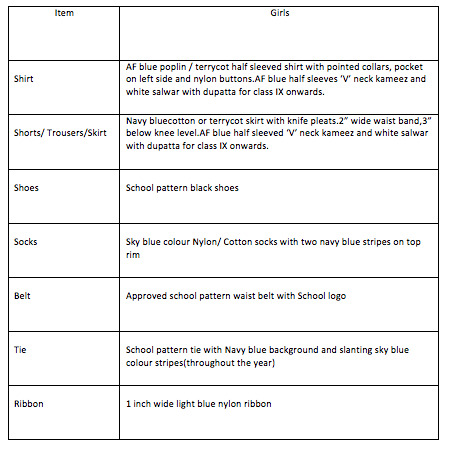 Reporting Time for classes I to X – 8.20 a.m.
On Wednesday - for PT, the colour of shirt , trousers , skirt, ribbon , shoes and socks will be white. On Saturday - House colour T- Shirt , white colour track pant (I-X) ribbon , shoes and socks will be white. a) Misbehavior towards teachers or any other employees of the school. h) Associations with banned organizations. 2) In above acts of misconduct, Principal shall take suitable actions as per observations of the disciplinary committee depending on the graisty of the misconduct, which may include. b) Suspension from attending classes/school for a specific period.